Among the goodies: “reverse Yankee” landmines. When a central bank like the ECB imposes negative interest rates along with QE on its bailiwick, funny things start to happen. Investors become so eager to get any kind of visible yield that they will do the craziest things. They’re now chasing €3 billion of 50-year bonds that the French government placed today. The yield? 1.916%. These 50-year bonds are bought by institutional investors who, in normal times, would have been institutionalized. The impact of negative interest rates isn’t limited to the bailiwick where they’re imposed. These yield-desperate investors will go anywhere to get some yield. They’re now scrambling to get their hands on Argentina’s new dollar-denominated bonds: $15 billion spread over maturities of five, 10, and 30 years, expected to come to market next week. This is a country that has spent 75 of the last 190 years in default, including 2013-15, 2000-04, and 1980-92. The next default might be ten years down the road. Since Argentina cannot default on those bonds via devaluation of the peso, it will have to default on them in the classic Argentine way. But investors need the yield now, and to heck with the risk of default. They’re hoping they can dump these things – or at least move on to the next job – before the government pulls the plug. Yet there are a few things that the noble combination of negative interest rates and QE has not been able to accomplish. Consumers, whether in the Eurozone, Japan, or other NIRP countries, are inexplicably leery of becoming even bigger debt slaves by borrowing to consume. And those who try it by running up their credit cards find that negative interest rates, or even low rates, haven’t made it that far. Lower rates push down mortgage payments. So that’s good. But they also drive up home prices, so asset price inflation, which in turn drives up mortgage payments. Ah yes, the irony of lower rates: the same house, a bigger price tag, higher taxes, and higher mortgage payments. And much bigger risks. When the whole construct falls apart, those home prices deflate. Hapless homeowners get kicked out. A new financial crisis ensues, to be solved with even more QE and more negative interest rates. And consumers still don’t consume more. A lot of consumers rely on the income from their bond portfolios and savings – whether directly or indirectly, via a pension fund for example. These consumers get trampled by low and negative interest rates. In turn, they cut back their spending. The more rates fall, the more they cut back. Companies – even junk-rated ones – can pile on cheap debt. This has created unique opportunities for US companies to sell junk bonds at ultra-low yields to the financially repressed investors in Draghi’s Eurozone. By now, “reverse Yankees,” as these bonds are called, dominate issuance in the euro bond market! These over-indebted US companies will have to service this euro-denominated debt with their dollar-denominated revenues, which gets even harder when the dollar falls against the euro. Reverse Yankees are the greatest gift Draghi has handed to Corporate America. And when these landmines explode, they will turn into yet another scourge Draghi has inflicted on his bailiwick. Japanese bond investors too, as they’re getting mauled by their own central bank, are chasing yield overseas, and so they came to the attention of Wall Street, which is selling them a variety of tempting products, including highly rated yen-denominated bonds backed by dollar-denominated Collateralized Loan Obligations backed by leveraged loans of junk-rated US corporations. Yup. Corporate America is the true beneficiary of these crazed negative-interest-rate policies in the NIRP zone. So does that help the economy, boost demand, or trigger inflation in the NIRP zone? Nope. These companies are not investing the proceeds in productive activities in the NIRP zone. Instead, they buy back their own shares, pay their PE-firm owners special dividends, or pay off other investors. If they invest, they go after Vietnam, Mexico, and other cheap-labor countries. Leaves governments, the other true winner in this scheme. With negative yields gracing much of their debt, they’re getting paid to borrow. In the negative-yield absurdity, a government deficit becomes a government profit center. OK, bondholders pay the price. But by that time, the money managers who made those decisions will have moved on. Others hope to sell these bonds at even more negative yields long before they mature, and thus at a higher price, to the greater fool down the line, namely a central bank, which by then will already own much of the debt out there. Whatever the real reasons for negative interest rates and QE – whether to bail out over-indebted companies, create more asset bubbles to enrich the few, allow some to borrow at negative rates while getting investors stuck with the bill, or create special opportunities for central banker cronies – the current and much publicized pretext for negative interest rates is to stir up consumer price inflation. At the end it ALL comes down to debt and the servicing thereof. ALL debt will be paid. Either with dollars worth pennies, or with pennies worth dollars. It will be paid. When kings become paupers and paupers become kings. Paper wealth is a castle built upon shifting sand. It may have the appearance of substance, but is in fact dangerous. These so-called AAA rated, Yen denominated bonds which are based in dollar denominated CLO’s that are backed by leveraged loans from junk rated US Corporations, are nothing more than weapons of mass financial destruction. When the ‘Piper’ stops playing there will be no chairs and yet, he will still demand to be paid! I have long maintained Janet Yellen’s a far subtler strategist than many give her credit for, whether they support NIRP’s, QE or “interest rate normalization”. By doing nothing more than issuing the regular mandatory statement to sooth frayed nerves on Wall Street she’s effectively winning the currency wars without firing a shot. Yellen and other Fed governors have followed very closely Europe’s experiment with NIRP and came to the conclusion everybody knows: not only they flat out don’t work, but they end hammering banks because once yields turn negative the spread is squeezed even further, making turning a profit even harder. Morale: unless a lot of political pressure is applied, NIRP’s are not going to come to the US. Of course there’s the problem of that mountain of sovereign, municipal, corporate and private debt but as long as foreign countries remain under the heel of financial repression, investors from Sweden, Germany, France, Japan, Switzerland and even China will be happy to scoop up that debt, as toxic as it is, because it’s a better deal than they are offered at home. Yield on bonds issued by a teetering US fracking outfit may not reflect risk, but it’s a whole lot better than the microscopic yield offered by junk-rated moribund Austrian and Italian banks. Yes, the bill will come due, if not this year in the next decade, but when it’ll be time to pay it will mostly be foreign investors who’ll be stuck with a mass of worthless paper issued by bankrupt municipalities and corporations. In short, and here’s the genius in Yellen’s grand strategy, any financial crisis will be outsourced. It will be up to the BOJ, the BNS, the Rijskbank, the PBOC and the ECB (if it’ll still exist) to sort it out and they will be all out of arrows, as they shot everything they had in the name of asset inflation and to allow debtors to party like it’s 2006 all over again. Already now all that remains in their quivers are blunt instruments of financial mass destruction which may truly cause savers and taxpayers to grab torches and pitchforks. In the meantime the BOJ, the ECB and their siblings will continue to chase inflation and buy assets hand over fist, thus making US dollar denominated assets more and more palatable and indirectly increasing the exposure of their own subjects to any risk originating in the US. A company filing for Chapter 11 or Chapter 7 in the US is completely out of reach of European and Asian governments. They cannot do anything about it. Any attempt to interfere with the workings of US courts would be shot down in a split second by a very angry Washington. Rumors of the dollar’s death have, in my opinion, been greatly exagerated: there are a lot of advantages in being the less dirty shirt in the laundry bag. The counterparty risk of investors who seek yield Only in non-productive enterprise is a decrease in the supply of Real Things(the law of supply and demand). But that is a Very Long Term cause and effect statement. What I think is the real relationship between falling prices of consumer goods and interest rates is Greenspan’s dictum that interest rates cannot be raised unless Consumer Debt(credit cards)has increased. That is, if people are Not spending, demand is down for goods and their prices will fall AND interest rates cannot be raised. Dollars are the only game in town. The US still has a military to back its dollar and the USA is the only market big enough to park big money. The DOW could easily double when the panic sets in and folks become desperate to park their money. The only two slightly less dirty shirts I see on monetary markets right now are the US dollar and the Swiss franc. NIRP lunacy apart, the franc has long been our (Europe) favorite “fallback” currency and still is, as the BNS throwing the towel in on the frankly lunatic peg proved. The British pound may make a comeback after people realize whatever the result of the so called Brexit referendum the world won’t be coming to an end, but still is a currency I’ve never been really comfortable with, just like Scandinavian ones. Unless one of the other central banks reverse course or Yellen is armwrestled into going NIRP mode, the US dollar remains a good long term choice. So long horizons and carefully sniff the political climate in Washington: the Fed is “fictionally independent”, and past US presidents forcing monetary policy changes for short term gains (example: Nixon’s re-election) are a worrying precedent. For Europeans, with long experience, gold is perhaps the cleanest thing of all. And so of course, it is penalized various ways, because it is proof against monetary insanity and bankster criminality. Can’t buy groceries with it, but it never goes out of style. Just go to the local moneychangers, change your gold for cash, and buy groceries. The black market is always the real market. Gold has performed well against the euro in 2014 and very well in 2015. The reasons for this go deeper than lack of trust in the EMU. One little spoken of problem is lack of physical: for well over a decade now Europe has seen a net outflow of gold, as contracting real wages (let’s not delude ourselves with the whole “deflation” stick) and changes in consumer/saver preference have meant gold has not been hoarded but sold, and on a quite large scale. To put it blunty gold has lost a lot of its luster both because, plainly put, few people cannot afford it. The mad scramble for yield highlighted in the article means that more savings have to be invested in “financial instruments” and so less can be used to buy gold. The lure of stock markets also destroyed a whole lot of wealth: as of today, the DAX is down 2000 points year on year. It would be far worse if not for one of those depressingly common dead cat bounces based on the concept of “bad news is good news” which end up luring more unprepared investors into the fray. To get back to us, most of Europe’s gold ended up in Switzerland and from there it was exported to Hong Kong, Mainland China and India. Swiss gold refineries have been running double shifts for a few years now to cope with demand from Asia, fueled by the availability of large quantities of physical from Europe and, now, South America: Venezuela has just sold a large part of her gold reserves to a Swiss company which offers “all inclusive” bullion and ingot services to Asian buyers. As far as I know, I am one of the few people I know still clinging on to physical. It’s very much like taking an insurance policy: you hope never to have need of it, but if you do, you’ll be grateful to have set aside some money for it in the days. And we thought the subprime fiasco was bad…. you aint seen nothing yet! ” Dollars are the only game in town.” That’s the beginning & end of it and why people put mental block to accepting they are just paper and our debts are to high to pay. Japan is heading for a full-blown solvency crisis as the country runs out of local investors and may ultimately be forced to inflate away its debt in a desperate end-game, one of the world’s most influential economists has warned. Olivier Blanchard, former chief economist at the International Monetary Fund, said zero interest rates have disguised the underlying danger posed by Japan’s public debt, likely to reach 250pc of GDP this year and spiralling upwards on an unsustainable trajectory. The problem with Japan is one and one alone: the whole country is sailing into uncharted waters. The domestic sovereign bond, ETF and REIT market has been completely destroyed by the BOJ, real wages are contracting (at least a success: inflation is flaring up in the land of the Rising Sun), the pool of net taxpayers is shrinking due to the local version of Baby Boomers retiring in record numbers, policies aimed at “thrashing” the yen to stimulate exports have failed, China’s appetite for imports is waning… you name it. Many want to see a perfect storm brewing, others a “collapse” but my take is simpler: I have absolutely no clue what will happen to the world’s third economy. Great place to live if you have money, can speak/read the language, its safe, and housing out in what the Japanese call the “country” (others would call outer suburban areas) is cheap as it has ever been. In many places you can buy a nice house with a good size lot (1/4 acre) within 5 miles of a train station for a couple hundred thousand US$. If you can borrow the money to buy your interest rate is less than 2%: cheaper than renting. So Wolf, when are you going to leave California and move back to Japan? If I could (the better half doesn’t want to), I would tomorrow!! Since my wife is Japanese, I’m already with one foot in Japan. Just went back in Nov to visit my in-laws. Super people! We used to live in Tokyo. Great place, as you said. I don’t read the language (well, I got to where I could decipher maybe 200 kanji which I have now mostly forgotten) and my spoken Japanese is awful and getting worse. And someday we might move back. But my WIFE doesn’t want to move back! For now, we love it in San Francisco. Nothing like the pristine water of the Bay to swim in every day. OK, I do swim in it every day despite its temperature, but I was a bit sarcastic about the “pristine” part. 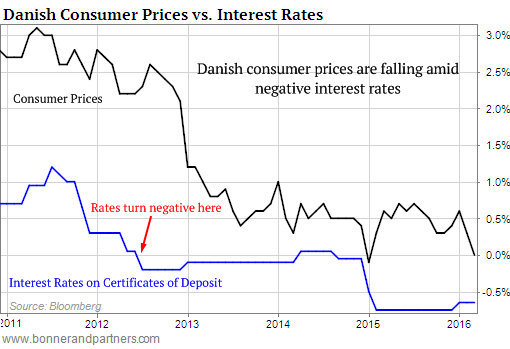 It should be no surprise that Danish consumer prices fell as NIRP was introduced: the banks were simply stealing their money so they had less to spend on goods and services. The entire system is predicated on “growth”, on yield…there are pensioners to be paid, insurance company actuarial needs, payouts and dividends of all kinds o be funded. And it is still all expecting @%6-8p.a….in a no-growth world. Check-receivers of all kinds, mutual fundees, pensioners, payout recipients, ‘stream-of-income’ dependents and governments have a whole New World of zero returns, in which preservation of capital will gradually supplant “yield”, coming. Economic collapse means unrest, disruption, and eventually war. Look at the maelstorm unleashed with the Versaille Treaty and the rise of Hitler after Germany collapsed. Apparently, the US came out the winner for a few decades after their competitor’s industries were wiped out. However, the world is a lot smaller these days, and very much linked in both health and sickness. The US economy does not operate in a vacuum. A collapse of Japan and/or Europe will hurt us all. Big time. It would create a worldwide depression and perhaps much much worse. I am not a “the sky is falling” person in that I do not believe, short of a nuclear war or some other catastrophic event, in the “collapse” many speak about. Q) How did you go bankrupt? A) Two ways. Gradually, then suddenly. I’ve been in a company that went through our local equivalent of a Chapter 7 bankruptcy. It went burst exactly like Hemingway’s character: by the time things started going really badly it was too late to do anything but throw the towel in. Before that, denial reigned supreme. Those voices which raised from the ranks to warn we weren’t doing as well as we wanted to believe were not merely ignored, but shut up. Those voicing their concerns were branded as alarmists: we need to get into debt a bit more to expand operations; supply will create its own demand; just wait until we sign that contract with Russia… the usual things. Right now we are still in the going bankrupt gradually phase: things can still be turned around. But denial is still strong, as is blind belief magic cures exist that will allow us to get out of this slump without pain. There aren’t. A lot of firms need to go burst and a lot of people need to go bankrupt. A lot of governments need a bond crisis to give them back some semblance of fiscal discipline. As a Jewish professor once remarked to me “Capitalism without the threat of bankruptcy works as well as Christianity without the threat of hellfire”. In short a shock is need to restore discipline. But the longer that shock is delayed, the worse it will be when it comes. It doesn’t need to be a 1929 style Depression. We are already seeing some signs market forces are at work: monetary policies don’t work anymore and asset bubbles tend to be highly localized these days. Just look at housing: outside of crazed prime markets there isn’t a whole lot going on despite dollars, euro, yen and yuan being pumped into the system to reinflate assets all across the board. No Chinese billionaire or Malaysian magnate wants to buy a house in Mossport Mississippi. More to the point, corporations are getting paid by the government to export that country’s economy. Your tax dollars at work. It now becomes clear why the real economy has never recovered. The policy goal is to reduce it to smouldering rubble. To create the need for a rescue of the ensuing panic: The New World Order’s one world currency..whatever that may be. Biometric “tattoos” anyone? Given Argentina’s history,it is pretty clear that there are number of masochists among financial managers. Inherent in the argument AGAINST buying French bonds @%1.91 is that either inflation is going to run high enough to reduce the real return (#2 above) to an inadequate amount (or even negative) OR that France is going to default on payment of the principal.Default can consist of an outright default or a depreciation of the currency. I have a question for all those who argue and have argued that Japan’s level of debt would eventually lead to disaster.There is nothing new in this argument.Why has this not happened yet?And why has the Yen rallied against the dollar since early Dec? 2% on a 50-year government bond (from a nearly bankrupt country) might be more attractive than lending money to Dutch homeowners with negative downpayment and a fixed 10-20 year rate of 2% or so, while Dutch home prices hover near all time highs. A government always has some possibility to pay back, but you can’t draw blood from homeowners who start out with negative equity right away. Reading the Dutch financial websites is telling: stock investors and homeowners feel invincible again, they were SOO clever for buying the maximum home with the maximum mortgage. And politicians love it! While some consumers are leery to take on more debt, many are living the good times again – they learned from the 2008 episode that there is no punishment for acting financially irresponsible. Homeowners who don’t pay aren’t kicked out, that only happens to renters who are a few months behind in paying the rent. BTW, I can assure you that the EU consumer price indexes are a blatant lie (just like those in the US). Almost anything that you can’t avoid is going up in price every year. I don’t doubt that inflation is already above the official 2% ECB target, they just manipulate the number down to keep these crazy policies to enrich the elite and exterminate the middle class going for a bit longer. Not in Australia, they don’t. The spread between the discount rate and adjustable rates mortgages (ARM’s) at the time of the GFC and now has INCREASED by about 1.9%. That’s right. Banks here are making more money off ARM’s now than they have been anytime since the GFC. Several months ago the regulators were screaming about risk so the commercial banks here implemented an out of the cycle rate INCREASE of 20 bps for ARM holders. It was supposedly to offset the need for higher costs as a result of having to hold more assets against those risky ARM’s. Yep, so the bank that initiated the increase then went ahead and increased its dividend. From the ARM payers right into the pockets of the bank shareholders. So much the need to hold more cash by the bank. Then they announced record earnings. So much for ‘increased costs”. A blatant ripoff by the banks to increase their bottom line. Speaking of which, it isn’t going to be those mortgages that hit the bottom line. Of course banks here went ahead and lent all sorts of money to mining and energy companies and guess what? Yep, they are going to book hundreds of million of dollars of impairments. INCREASE RATES ON ARM”S AGAIN. Just have to wait: shafted in Oz again.